When we moved to the Twin Cities from North Dakota in 1999, we were stunned by all of the wonderful restaurants. More specifically, the ethnic food choices were mind boggling. We simply did not have access to these types of food where we grew up. One of the very first places we tried was a small Vietnamese restaurant on the Midway in St. Paul. It had recently been in the paper for having one of the best bowls of pho in town and the photograph that accompanied the article made my mouth water. I didn’t know what pho was, but I knew I had to try it– and it. was. wonderful. We still go to that restaurant occasionally during the Winter months, though now it’s more likely that you’ll find me making this dish at home. 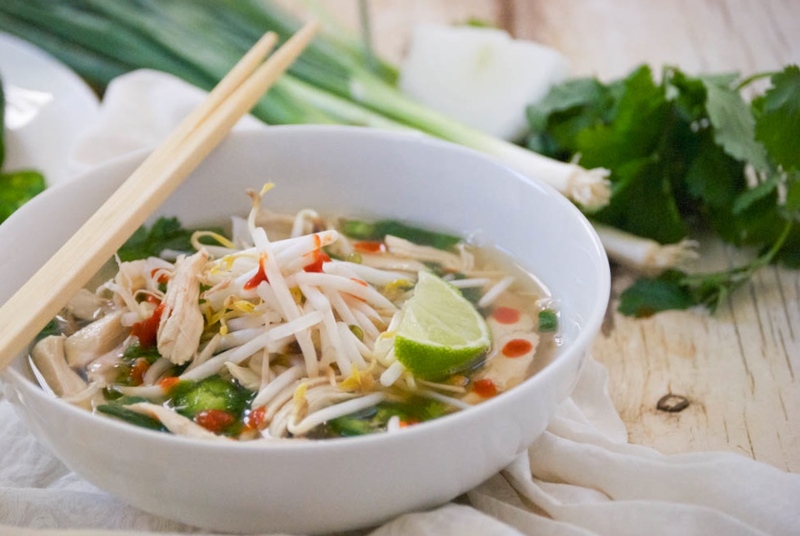 It’s quite simple to make a delicious bowl of pho ga that can come together quickly so long as you have the homemade chicken broth ready. And again, here you’ll want to use the homemade broth– it’ll make the difference. I generally pull a couple of jars of broth and some shredded, cooked chicken from the freezer just a little while before we want to sit down for dinner. 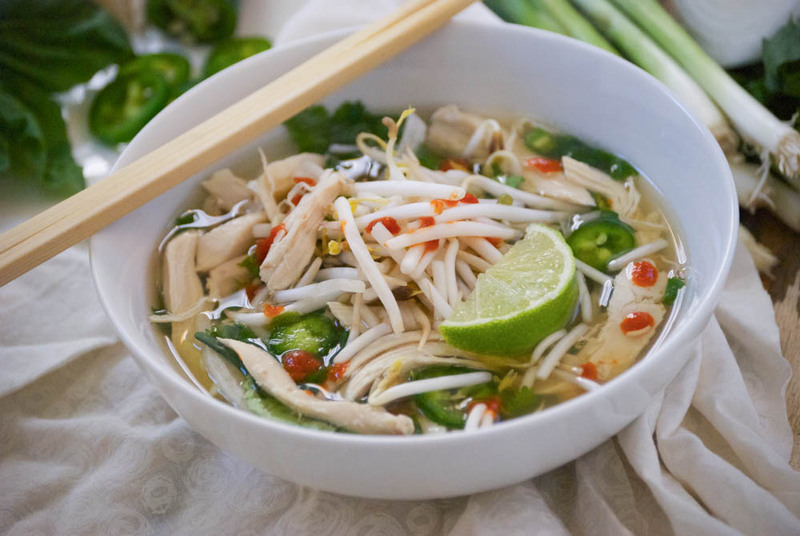 Pho is all about a simple, flavorful base– some chicken, some rice noodles, and then load the top with fresh ingredients. 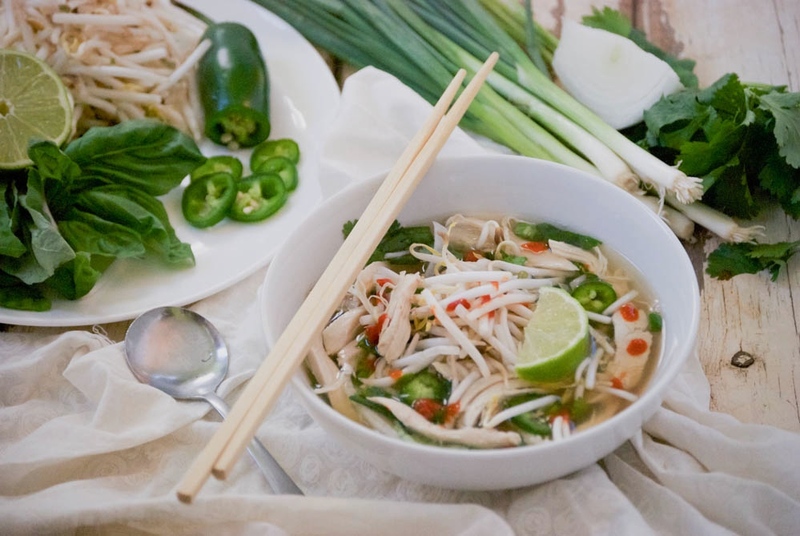 No two bowls of pho are identical, at least not in our house, because we all add our own little additions. 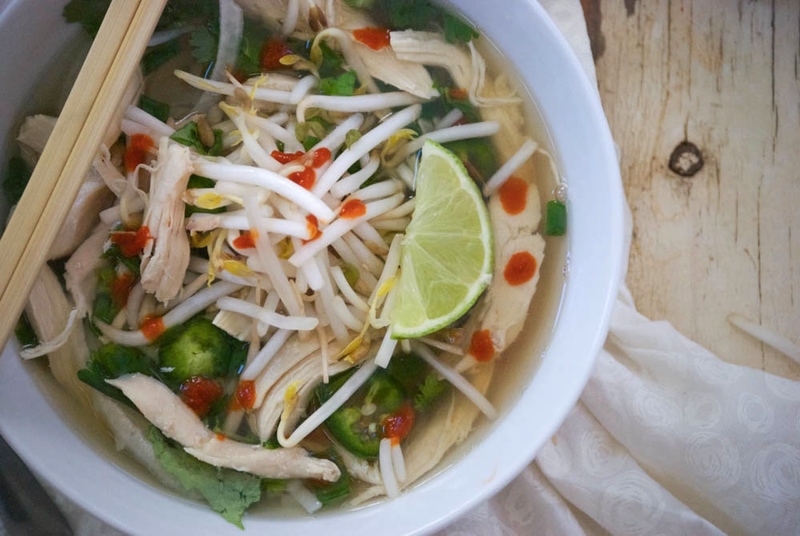 I love fish sauce and sriracha mixed into my broth– my kids, not so much. I also load mine up with jalapeños, basil, sprouts, and a healthy squeeze of lime. It’s sublime. This soup will warm your body and if it were possible to do– I believe that it may actually warm your soul. Think of a snowy, cold night tucked in at home. Light a candle or two and nuzzle in. 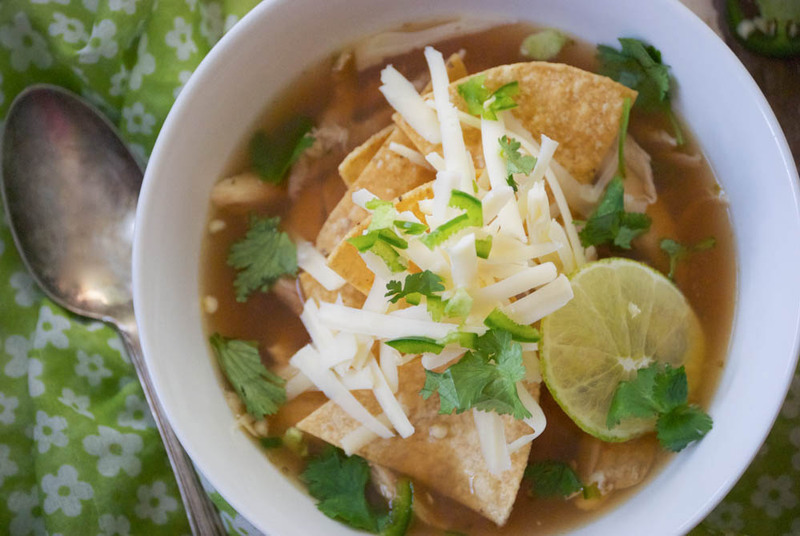 Slurp on a bowl of this soup with your family or friends. It makes the Winter months that much more enjoyable. For this recipe, I’m assuming you have homemade chicken broth at the ready. If you don’t– make some immediately. If you don’t have time to wait the full 24 hours for it to simmer, that’s fine. Three hours or so, will work. Follow these instructions and add the pho ga broth spices (fresh ginger, cloves, allspice berries, coriander seeds, and star anise) right into the pot. Note: You will have much more broth than the recipe calls for, but that’s not entirely a bad thing. You may want to up the amount of spices, as well. Begin by adding two quarts of homemade chicken broth to a large saucepan or kettle. Place the ginger into the pot along with a spice sachet or cheesecloth tied with string filled with the cloves, allspice berries, coriander seeds, and star anise. Bring to a boil, then reduce to a medium simmer and let cook for about 45 minutes, so that the flavors can infuse. Meanwhile, when the broth is nearly finished, cook the rice noodles according to the package instructions (I generally cook them for less time than suggested)– they don’t take very long to cook, so keep a watchful eye. You do not want the noodles to become mush. Fill your individual bowls with the rice noodles, shredded chicken, some sliced white onion, a bit of cilantro, and sliced scallions. Remove the ginger and spice sachet from the broth. Ladle the hot broth into the noodle filled bowls. 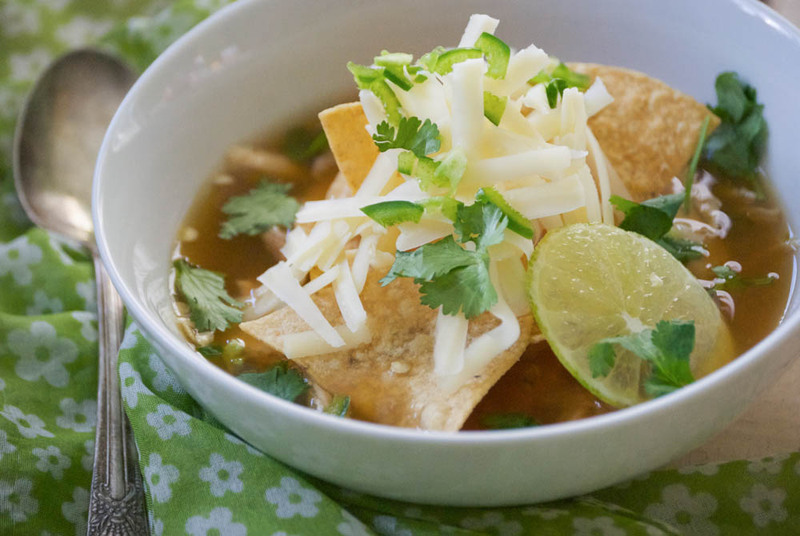 Serve with accompaniments– fresh basil, bean sprouts, fresh jalapeño, and lime. Along with the condiments– fish sauce, sriracha sauce, hoisin sauce, soy sauce, and red chili paste. Enjoy! I hope you are all having a wonderful week so far. Take Care! Hello, friends! I hope you all had wonderful holidays. Ours was busy, yet really fun. We did a bit (17 hours!) of driving and managed to see a lot of our family. Since Christmas is such a special time, I really try to keep the focus on my kids and making memories with them– thus the lack of blog posts for the last few weeks. But yesterday I sent the little ones back to school after an additional two-days off due to the extremely cold weather here in Minnesota caused by the…POLAR VORTEX! Have you heard about this thing?! I’m kidding, of course you have. It seems to be pretty much the only thing that’s been on the news for the last two weeks. Well, we actually didn’t mind it much. We played a lot of indoor games (Life, Jenga, Battleship, and Uno each saw some use), and we ate a lot of delicious soup. Which, I guess, is my segue into today’s recipe. I have two amazing soup recipes that I plan to share over the next week or so, but before I get ahead of myself, I want to talk about homemade chicken broth. 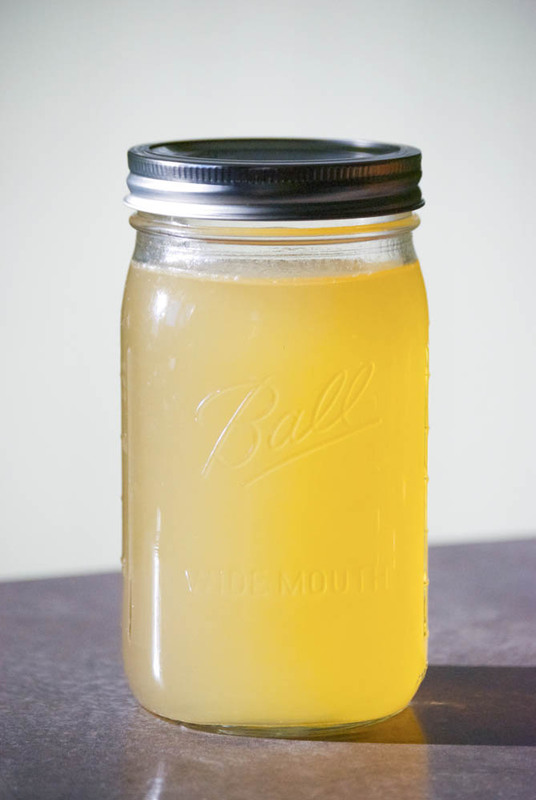 Homemade chicken broth is the cornerstone to both of these recipes. While I know that making homemade broth is an old hat for some, for most the solution is picking up a box at the supermarket. I’ll be honest, that’s occasionally been my solution too, though we recently got another freezer, so I’ve been making broth non-stop now that I have more space. 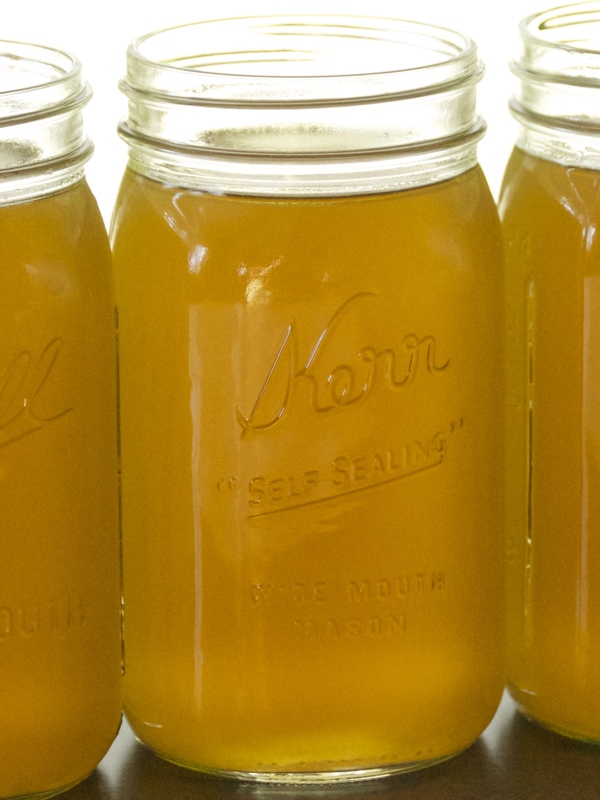 There are so many health benefits that come with good homemade chicken broth. It was with good reason your Mother and Grandmother fed you chicken noodle soup when you were sick as a child– they knew what they were doing. One of the nice things about making chicken broth is that it can be as easy or as involved as you want it to be. Pretty much any amount of effort will most likely yield something far better tasting than what you get in those grocery store boxes. Throw a chicken in a pot with a few vegetables, a few herbs, water, salt, and perhaps a glug of white wine. There it is. So what are you waiting for? Alright, a little more detail. Broth can be made with whole chickens, chicken parts, of just bones (though, technically this last one is called stock). I generally buy a whole (organic, pasture-raised, etc) chicken that is about 5 pounds. And contrary to what you may have heard, the meat from the chicken is definitely still useable after you have simmered it to make broth. The chicken retains its wonderful texture and moistness. The key is that you have to know when to remove the chicken from the simmering pot. Here’s how to do it: after 2 1/2 – 3 hours of simmering, take the whole chicken out and remove the tender, fully cooked meat. Then return the bones and skin to the pot and continue to simmer. 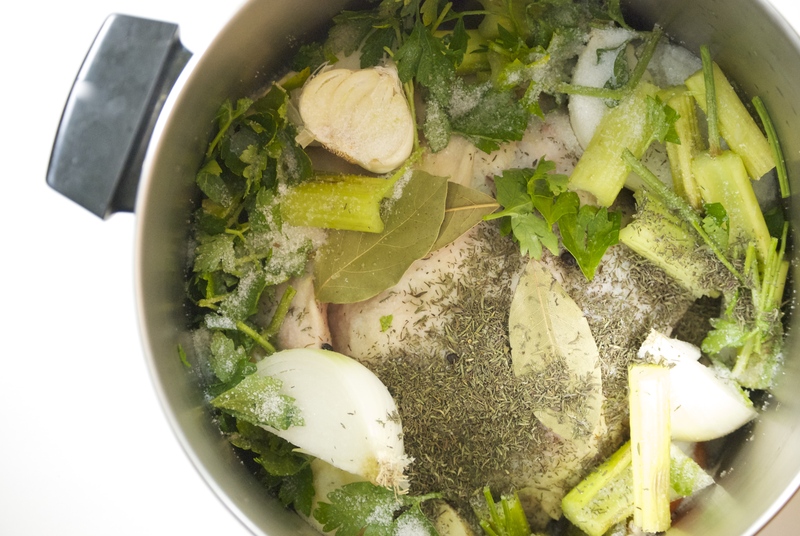 I normally simmer my broth for 24 hours– you can get so many healthy things out of that chicken the longer you simmer it. However, if you can’t simmer it for 24 hours due to your schedule, anything longer than 3 hours will be just fine. If you can stretch it to anywhere between 8 and 24 hours, it gets even better. Monetarily speaking, it also makes sense to make your own. The cost of the chicken alone is less than I would spend on the amount of broth I yield from one bird. Plus, I get delicious tender, flavorful chicken that I can plan meals around. 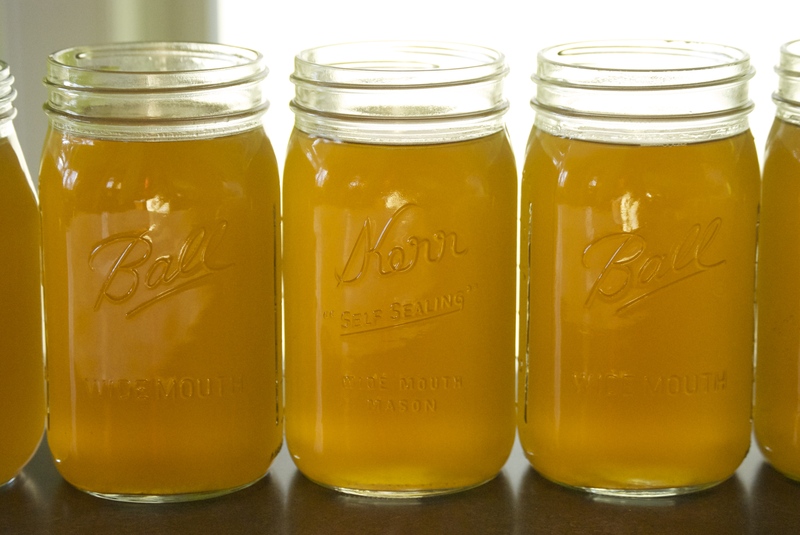 I store my broth in the freezer in wide-mouth quart jars. I’ve made the mistake of using regular jars and have had some crack. I also don’t put the lids on initially, leaving 1-inch- 1 1/2- inches of space at the top to allow enough room for the broth to expand as it freezes. I then put the lids on after it has frozen. You’ll find that once you make your first batch of broth, you won’t be able to turn back. Honestly. 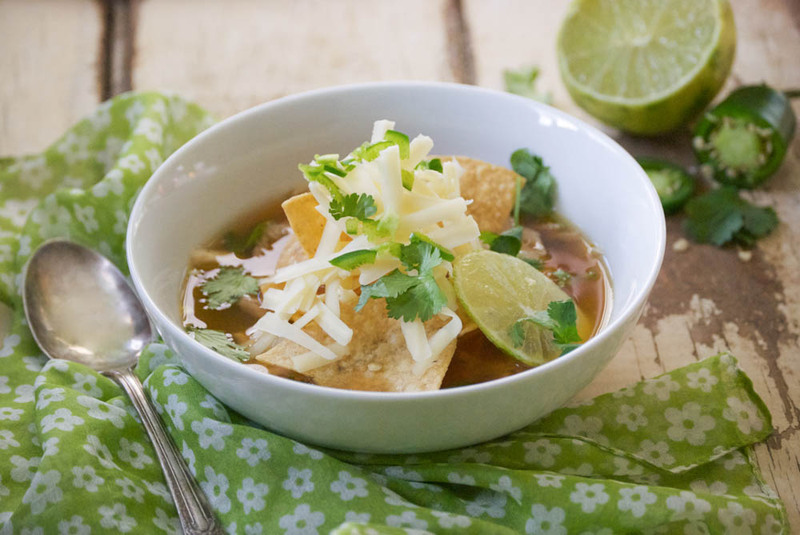 Enjoy– get started on that broth and I’ll meet you back here very soon to talk about some delicious soups you can make with it! Note: Remember, this is my version to make the broth. If you don’t have all of the ingredients, don’t sweat it. Use what you do have. It’ll be delicious. Also, when using the wine, if you’re not planning to finish the bottle, portion it out into containers, freeze, and use some the next time you plan to make broth. It works great! Add all of the ingredients to a large, heavy-bottomed stock pot. Fill with cold, filtered water– enough to cover ingredients by 1 inch to 1 1/2 inches. Bring the ingredients to a near boil, skip off foam using a spoon, then reduce the heat to the lowest setting with the lid ajar ever so slightly. You’ll want it to be on a very low simmer with the smallest amount of bubbles forming for the remainder of the time. This will keep the evaporation to a minimum, as well as let the flavors deepen. Simmer for about 2 1/2 hours. Then carefully take the chicken from the pot and remove the meat. At this point the chicken will shred beautifully. You can use the meat immediately, or freeze for another time. Return the bones and skin to the pot and continue simmering for another 21 1/2 hours, or less time if need be. When the broth is done, you will want to strain and discard the bones and vegetables– they’ve served their purpose. Using the back of a large spoon, I often push the carrots and parsnips through the strainer– it gives the broth a wonderful color and flavor. 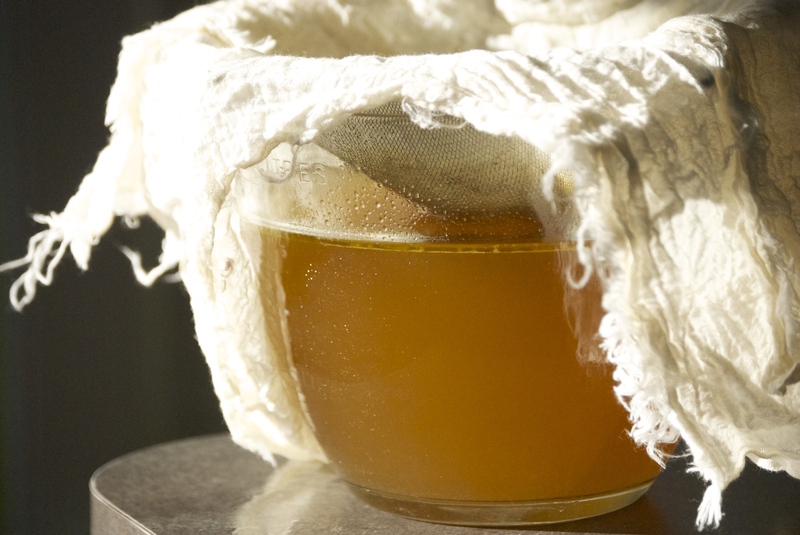 After you’ve removed the large chunks, you’ll want to pour the liquid through a cheesecloth, so it is nice and clear. At this point, you can decide if you want to remove the fat from the broth or not. Some people prefer the richness it adds and leave it in there. I pour it into a gravy separator, the kind where the spout is on the bottom and the fat floats to the top. If you don’t have that, you can also try a large resealable bag– the fat will float to the top and you can make a small cut on the bottom. This may be tricky, so be careful. Another option, is to wait until you place it into the jars or plastic containers, if using. Once the broth is cold, the fat will harden and you can simply remove it. When pouring into the jars, or plastic containers, if using– make sure to leave about a 1 1/2- inch space from the top of the jar. The liquid will expand as it freezes. Cool the broth completely before placing the the freezer. I choose not to place the lids on them immediately, instead waiting until after they’ve fully frozen. Thaw in warm water or place in the refrigerator when ready to use. Enjoy!